The Texas Tribune is happy to announce a partnership with ProPublica this election season to help them track political ads on Facebook. We need your help. During the 2016 election cycle, our Facebook feeds were flooded with ads from candidates — and foreign operatives — trying to influence voters. Fast forward to July of this year, when Facebook said that it had already identified and removed 32 fake pages and accounts built to disrupt this year’s midterm elections. But that likely won’t be the last you hear of this. As we inch closer to November, there are likely to be more political ads and interference campaigns spamming the web. Now, we’d like to have a hand in tracing them. 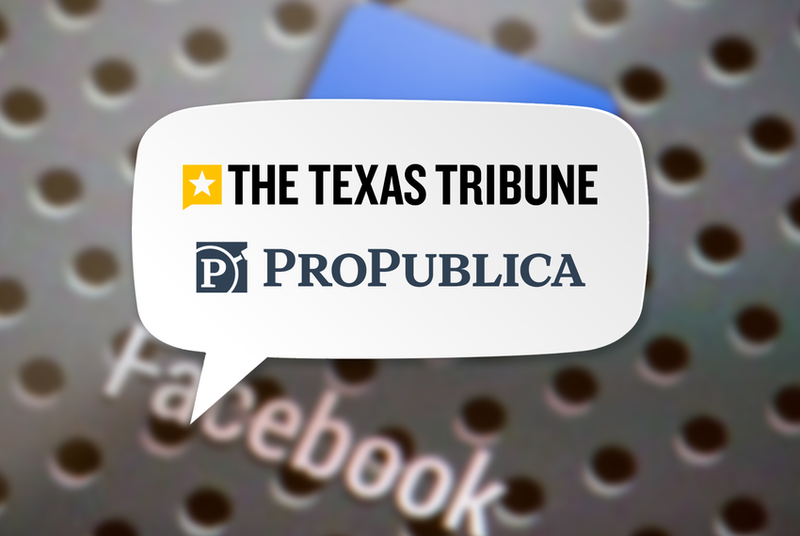 The Texas Tribune is happy to announce a partnership with ProPublica this election season to help them track political ads on Facebook. This will all be done through ProPublica’s Political Ad Collector, which relies on a community of voluntary Facebook users to gather and submit ads for its database. Interested in helping out? This is how it works: Start by downloading ProPublica’s free browser add-on through either Firefox or Chrome. The plug-in allows users to automatically — and anonymously — send ads that show up on their feeds. The extension will collect the ads and guess which ones are political based on an algorithm. Users are able to “help” the tool by classifying which ads are actually political and which aren’t, and they can also see ads from other users’ feeds. It’s worth noting that the plug-in does not collect any personally identifiable information like your name, birthday or friends list. If you’re interested in learning more about how the plug-in was created, see ProPublica's methodology. Since launching the add-on, ProPublica has collected more than 56,000 ads from more than 11,000 users — all of which you can search through here. The data collected is public and available for everyone to search through (including us). The tool makes it easy for users to see how candidates are targeting people in your city and age range. It will also help our reporting as we inch closer to Election Day and allow us to dive deeper into how political groups target Texas voters online. The tool has already been used to locate political ads that were actually scams and malware and ads ignoring federal campaign finance rules by not disclosing who paid for them. It has also been used to discover a fake Facebook page for special counsel Robert Mueller that had more than 100,000 followers and to expose dozens of large companies that were using Facebook to exclude older workers from job ads. If you’re a Facebook user, please consider contributing so we can continue holding politicians, interests groups and Facebook accountable. For more information on the Political Ad Collector, visit ProPublica’s website to find out how it works and why this matters.